My heart has not stopped smiling since the ALA Youth Media Awards press conference ended last week. I asked Matt de la Peña (Last Stop on Market Street), Kimberly Brubaker Bradley (The War that Saved My Life), Victoria Jamieson (Roller Girl),and Pam Muñoz Ryan(Echo) to answer two questions and finish one sentence starter. Today is Matt de la Peña's time to shine! Thank you, Matt! Mr. Schu: Congratulations, Matt! Everyone loves hearing about THE CALL. What ran through your head when the phone rang? What were you thinking about when the Newbery committee was clapping for you? Matt: When my phone started ringing, I thought, "Oh, wow, it must be my agent. 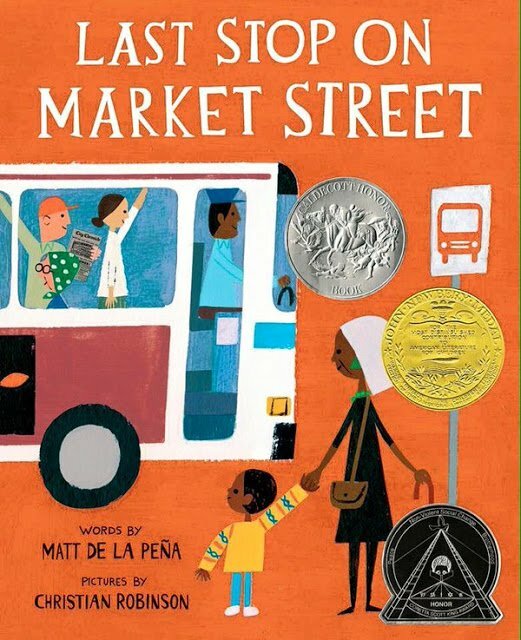 Maybe Last Stop got a Caldecott honor! But the man on the phone wasn't my agent. He introduced himself as Ernie Cox, chair of the 2016 Newbery Committee. And he told me Last Stop was the medal winner. And he began to say something about how the committee reacted to the text. But I could no longer hear this man. I was too shocked. And too humbled. And too overwhelmed with gratitude. We writers work so hard. Mostly in solitude. We build something based on a vague blueprint in our heads, and then we remake it over and over and over, a hundred times in some cases, until it loosely resembles what we set out to do. But some of us are still so unsure, even when we send that final draft off to the publisher. We only see the flaws. The sentences that could still be more musical. So when someone comes along and says it's good . . . I can't even explain the way that feels. I'm not usually an emotional guy, but when someone really "gets" what I'm trying to do in a piece, it makes me want to cry. That's what was happening inside my chest when I heard from the committee. Mr. Schu: What does the Newbery mean to you? Matt: It's an incredible honor, obviously. It's validation. It's a serious blow to my perpetual battle with the Imposter Syndrome. But now that I've had a few days to process it, I've realized its meaning runs so much deeper than I first believed. My whole career I've been writing about diverse kids growing up on the "wrong side of the tracks." When I go to tough, underprivileged schools I always start by telling the students, "I write books about you. About us." "But why, Mr.?" they often ask. "Because our lives are just as beautiful and meaningful," I explain, "as the tree-lined lives you see on TV." But I'm not always sure the students believe me. And their skepticism breaks my heart. The Newbery adds a whole new layer to my argument. It's a powerful experience to see yourself as the hero in a book. But maybe it's even more powerful to see yourself as the hero in a book that has a shiny Newbery sticker on the cover. I look forward to the next time I have to prove to students their literary worthiness. School libraries are the heartbeat of our schools and one of the most crucial factors to our country's future. Borrow Last Stop on Market Street from your school or public library. Whenever possible, please support independent boookshops. Great interview Mr. Schu...you must love getting out of bed in the morning. I just read this book to some of my classes last week. It started a discussion about if they had ever ridden a public bus and the differences between subways & buses. My students don't have much familiarity with city life so they were interested in how different it would be to live there. We also talked about soup kitchens which none of them had ever heard of even though we have one not very far from the school.